Choosing the right size air conditioner for your circumstances is important. An air conditioner that is too large will cause you to spend more money than necessary. One that is too small will need to run all the time, and you still won't be comfortable. A correctly-sized air conditioner will save you money. Room-size air conditioners work well for rooms up to 400 square feet, or 20 x 20 feet. Their cooling capacity ranges from 6,000 to 10,000 British Thermal Units (BTUs). BTU is a standard measure for energy. Roughly 1 BTU would heat 1 lb. of water from 39 to 40 degrees Fahrenheit. 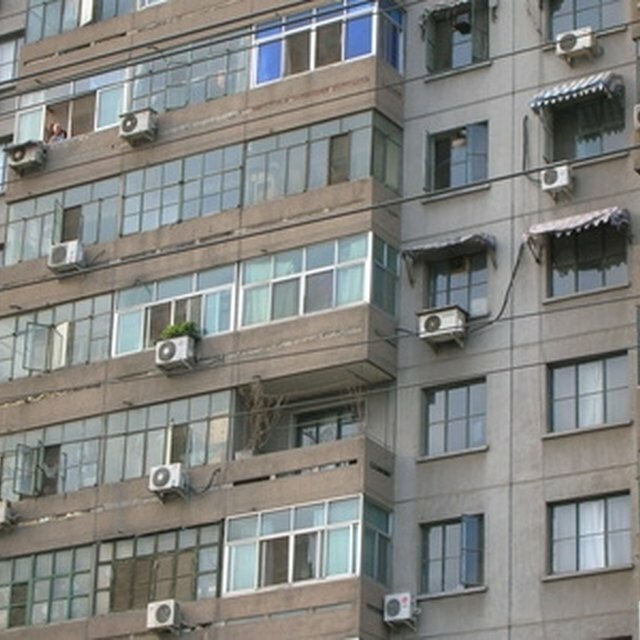 Your main use for the term is to compare the size of one air conditioner to another. Portable air conditioners that you move from room to room generally have a capacity of 7,500 to 14,000 BTUs. Multi-room air conditioners range from 10,000 to 16,000 BTUs. They would typically be used for rooms in which the total square footage was below 800 square feet. Many kinds of central air conditioning are used, but most involve an indoor air handler (a fan and ductwork that extends throughout the house) and an outdoor condenser/compressor. This type of air conditioner uses a refrigerant and operates in a way very similar to how a refrigerator operates. This formula will tell you how big an air conditioner you need for the space you want to cool. Measure the square footage of the room or rooms you want to cool by measuring the length of the room and the width of the room and multiplying the two numbers together. If you measure in feet, you have your answer for that room. If you measure in inches, divide your answer by 144 (the number of square inches in a square foot) to convert your answer to square feet. Add together the square footage of the rooms. Use these numbers to give you an idea of how much cooling capacity in BTUs you need. For one room of 100 square feet, you need 4,000 to 6,000 BTUs; one room of 100 to 180 square feet, 6,000 to 7,500 BTUs; one room of 180 to 270 square feet, 7,500 to 9,000 BTUs; one room of 270 to 400 square feet, 9,000 to 10,500 BTUs. For several rooms up to 400 square feet, 10,500 to 12,000 BTUs; several rooms of 400 to 500 square feet, 12,000 to 13,500 BTUs; several rooms 500 to 700 square feet, 13,500 to 15,000 BTUs; several rooms 700 to 800 square feet, 15,000-16,500 BTUs. For large areas up to 1,000 square feet, 15,000 to 16,500 BTUs, 1,000 to 1,500 square feet, 19,500 to 24,000 BTUs, 1,500 to 2,000 square feet, 24,000 to 28,000 BTUs.